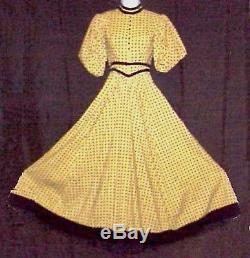 LOVELY CIVIL WAR 1880'S WESTERN FRONTIER PERIOD DRESS. WE SPECIALIZE IN OLDER VINTAGE MOVIE WARDROBE AND HAVE THOUSANDS OF REAL MOVIE WORN ITEMS IN CURRENT INVENTORY! This is a lovely Period dress we are offering! 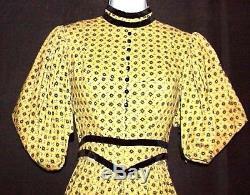 The dress is done in a light goldenrod and black print. The bodice is a simple classic cut with a small standup collar. The collar has 2 rows of black velvet ribbon and there are 8 small black buttons down the front. It has a front center point at the bodice hem that also has the double row of black velvet ribbon. It is fully lined in an off white cotton, has stays all around and fastens with hooks and eyes. The sleeves are VERY gathered and puffy with a single band of black velvet ribbon around the cuff edge. The long skirt is very gathered and full and could be worn over a petticoat or hoop. There is a wide band of black velvet ribbon around the hem. 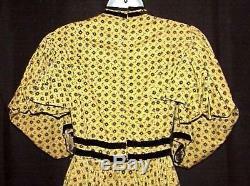 This magnificent dress has a label from Western Costume Company. It is tagged a 32" bust and a 23" waist. The skirt measures about 41" from center back waist to hem and overall is about 57". Please keep in mind the age of this gown and the fact that it WAS WORN in the movies it should be professionally cleaned! This is a beautiful collectable and needs to be seen to be appreciated. 99% of the time, with good communications almost any problem can be solved. Please keep in mind we sell Hollywood Wardrobe that is collectable. Please remember Communication is EVERYTHING because we will bend over backwards to help our valued customers. The item "CIVIL WAR WESTERN FRONTIER 1880s PERIOD DRESS EXCELLENT WESTERN COSTUME COMPANY" is in sale since Friday, May 11, 2012. This item is in the category "Entertainment Memorabilia\Movie Memorabilia\Wardrobe\Originals". The seller is "hollywoodmoviecostumes" and is located in Hesperia, California.